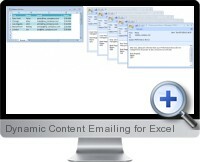 The Excel dynamic content email add-in (MultiMail) is a simple tool for linking categorized Excel content to personalized emails that can then be batch sent to multiple recipients with dynamic content. In the simplest functionality, a table consisting of email addresses and subsequent columns of additional data can be used to construct dynamic email messages for each recipient and then batch sent through Outlook. The dynamic content emailing in Excel, however, also provides more advanced functionality for speed up communication and provide powerful marketing tools. Very fast processing to send a large number of emails in a very short time. Quickly customize common text and dynamic placeholders linking to data for personalized content. Supports options for CC and BCC recipient management. Omit recipients from the bulk email routines by hiding rows. Options to preview the email messages before they are sent. Attachments can be sent with advanced options including a recipient specified tab as a separate workbook, a file from a folder path text and filtered ranges of data for each recipient.